It's never too early to start training a puppy. I'll start training a puppy as soon as you bring him home at 8 weeks old. I've had clients schedule appointments with me for the day they bring their new puppy home. Or you can have me start earlier-I can give advice on all the appropriate dog accessories you'll need to buy for your new family member-like collars, leashes, dog beds, crates, type of dog food, etc. I have helped many clients who would have otherwise bought the wrong things, and thus saved them money. Of course, I'd also show you how to deal with puppy nipping, whining, chewing and potty training. Then we'll work on the dog obedience training. Did you know that it's a myth that you can't teach old dogs new tricks? I train dogs of any age-I've successfully trained dogs that were 13 years old! So, if you have an adult dog that needs better manners or just doesn't listen to you, give me a call-I'm sure I can help! I can help you with the bad manners and any bad behaviors, and help you with dog obedience training too. Who's Top Dog in Your Household Right Now? How is your dog's overall behavior? Click here to take our FREE Behavioral Rating Quiz and see for yourself. 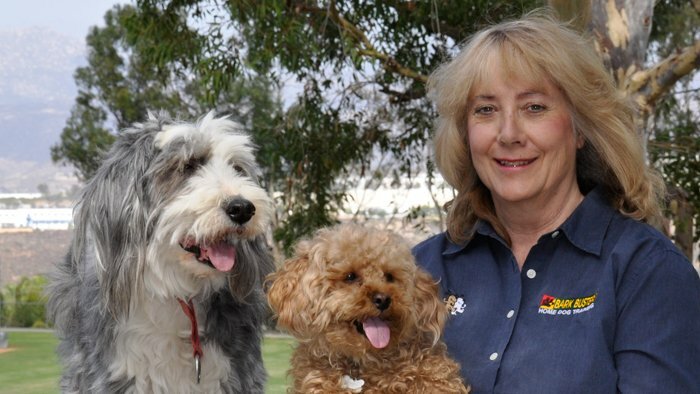 Call Jan Janecki, the Bark Busters Dog Trainer in San Diego County, today at and let her show you how to regain control of your dog, and become the leader of your "pack." Jan Janecki is a graduate of the Bark Busters Behavioral Training Program, an intense training in behavioral modification, canine communication, and obedience training techniques, and a leadership training program graduate of LEAD San Diego. She is a member of the Association of Pet Dog Trainers, The Ups and Downs Agility Club, The Bearded Collie Club of Southern California and the non-profit rescue organization BONE (Beardies and Others Needing Emissaries). Jan holds a Bachelors of Science Degree in Mass Communications from Arizona State University. Before training dogs, Jan was a marketing director in the financial services industry and taught business courses to humans at University of California at San Diego (UCSD) and Southwestern College.